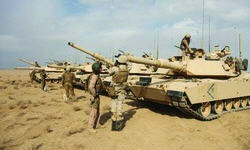 FORT LAUDERDALE, Fla. — U.S. Army Vice Chief of Staff Gen. Peter Chiarelli thinks the M1 Abrams tank is a good model on which to base the service’s upcoming Ground Combat Vehicle, since the Abrams has remained relevant and useful across a range of scenarios even though it has been in service for more than 30 years. The Abrams “has had incremental builds” while remaining “a platform that still shows great potential for growth,” Chiarelli said Feb. 23 during a speech at the Association of the U.S. Army symposium here. This modular, elastic approach is one that the GCV infantry carrier plans on adopting in everything from its armor kits to its electronics and communications systems. BAE Systems, General Dynamics and SAIC all are leading industry teams vying for the contract. The GCV is set to be fielded starting in 2017. “I think we learned the right lessons” from the failed Manned Ground Vehicle, the GCV’s predecessor and one of the failures of the Army’s ambitious Future Combat Systems program, he says. The GCV’s requirements sheet instructs industry to use only mature technologies to speed production and drive down cost, which is essentially the opposite approach from the one the Army followed in its MGV program. Meanwhile, U.S. Army testing of modernization technologies at Ft. Bliss, Texas, this year will be “one of the most important things we’ve done in a long time,” since the service now has an entire brigade whose sole purpose is to test and evaluate experimental gear before it is procured, according to Chiarelli. This entry was posted in Hobbies and Toys and tagged Collectibles, Hobbies and Toys, M1A1 Abrams, military models, tank models. Bookmark the permalink.